MRSA is Staphylococcus aureus that has acquired resistance to the antibiotic Meticillin. MRSA is resistant to all of the Beta-lactam antibiotics in common use: Flucloxacillin, Co-amoxiclav, Piptazobactam, Cephalosporins and Carbapenems. Although hospitals and the Department of Health concentrate on MRSA figures, 3% of the population carry MRSA as part of the normal flora in their nose and 30% of the population carry Meticillin sensitive Staphylococcus aureus (MSSA) as part of their normal flora. MRSA is usually transmitted between patients on the hands of healthcare staff or on contaminated equipment (fomites). MRSA are able to colonise people. Once the microorganism is part of the patient’s normal flora it can potentially cause infection and be spread to others at any time. The majority of infections with MRSA follow previous colonisation. Potential cross infection can occur at anytime whilst the patient remains colonised with the resistant bacteria, however risk is highest when patients have skin diseases that allow heavy shedding of bacteria e.g. eczema, psoriasis. Patients should be re-screened 48 hours after MRSA suppression therapy has stopped. 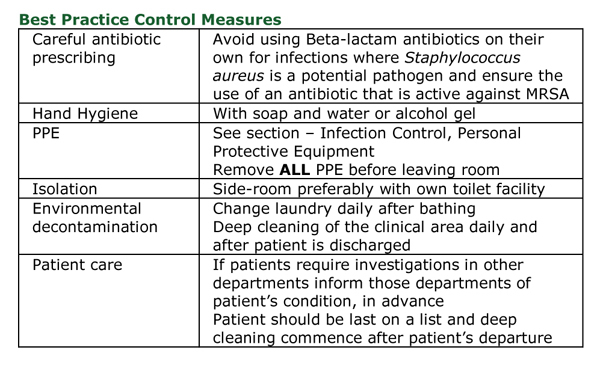 If the patient remains positive continue to manage as MRSA. If the patient tests negative rescreen at 48 hourly intervals until 3 negative screens at which point the patient is considered MRSA free. If any of these screens are positive then continue to manage the patient as MRSA positive.